Background: Anti-carbamylated protein (anti-CarP) antibodies are present in patients with Rheumatoid arthritis (RA) and may present before disease onset. Our aim is to investigate the diagnostic value of anti-CarP antibody in Egyptian RA patients. Methods: This cross-sectional study included 96 RA patients (56 patients with early disease and 40 patients with established disease) and 60 healthy controls. Demographic and clinical data, smoking status, and disease activity score were recorded. Laboratory tests included erythrocyte sedimentation rate, C-reactive protein, rheumatoid factor, anti-citrullinated protein antibodies, and anti-CarP antibody. Results: Anti-CarP antibody levels in RA patients were significantly higher than in controls (8.80 ± 5.95 vs. 2.19 ± 1.01, P < 0.0001). Out of 96 RA patients; 74 (77.1%) were positive for anti -CarP anti body including 47patients with early RA while only 5 subjects (8.3%) in control group were positive. Receiver-operating characteristic curve study for diagnostic efficacy of anti-CarP antibody in early RA diagnosis demonstrated a significant area under the curve, 0.950 (95% confidence interval, 0.912–0.987, P < 0.0001) and yielded a sensitivity of 85.4%, a specificity of 93.3%, a positive predictive value of 0.90, and a negative predictive value of 0.86. Conclusion: Anti-CarP antibody is a useful biomarker for early RA diagnosis. Rheumatoid arthritis (RA) is an inflammatory disorder presented by synovial inflammation. 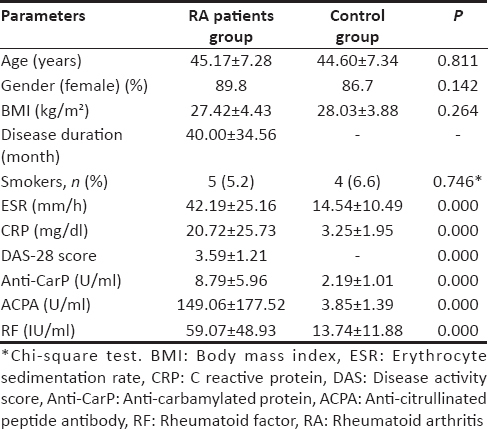 In the 2010, ACR/EULAR criteria included anti -citrullinated protein antibodies (ACPA) and rheumatoid factor (RF) in RA diagnosis, hoping to raise the sensitivity of diagnosis in the early stages of RA at the expense of lower specificity but leaving one-third of RA patients as a seronegative which was called serological gap., There has been strong impetus for discover serological biomarkers-further improve the early diagnosis of RA. During the last few years, numerous autoantigens have been described, and recently, a third type of specific autoantibodies has been described which showed reactivity against carbamylated proteins (anti-CarP). They could be beneficial for diagnosis or follow-up of the patients. The anti-CarP antibodies were detected in RA patients regardless of the positivity of ACPA., Anti-CarP antibodies target proteins that are adapted through a posttranslational adaptation termed carbamylation (carbamylation of lysine residues into homocitrulline by a nonenzymatic process). Anti-CarP antibodies have been recognized in RA and were related to disease activity in ACPA-negative patients. The anti-CarP antibodies were linked with the HLA-DRB1*03 allele while in patients with ACPA-positive RA had no such link. The anti-CarP antibodies potentially have an etiological part in the RA development as they may have a link with radiological destruction of RA, regardless of the ACPA status., The anti-CarP antibodies were found in healthy persons before clinical symptoms of RA,, and injection of carbamylated peptides experimentally in mice provoked destructive arthritis. Anti-CarP antibodies were linked to high mortality in RA patients. These results supported the concept that anti-CarP antibodies may have an important etiological impact and independent of other etiological biomarkers factors. Our objective was to assess the diagnostic utility of anti-CarP antibody in Egyptian RA patients and to what degree it can decrease the serological gap. 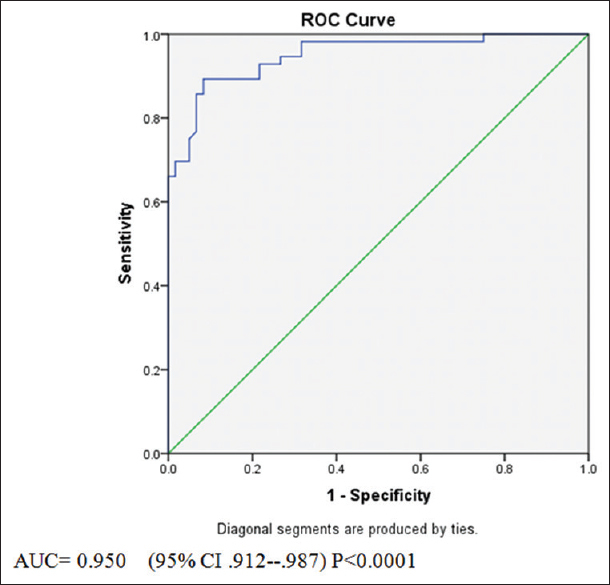 This cross sectional included 96 RA patients whom satisfied the ACR/EULAR 2010 criteria, with a mean age of 45.12 ± 7.28 years, and had 86 females and 10 males patients. Gender and age matched 60 healthy controls (52 females and 8 males with a mean age of 44.59 ± 7.27 years were also studied. RA patients were 56 patients with early RA (12 months or less from the diagnosis of disease) and 40 patients with established RA. The study was carried out on the Rheumatology and Immunology Outpatient Clinic, Mansoura University Hospital, Egypt between February 2017 and February 2018. Demographic and clinical data, smoking habits, and disease activity score in 28 joints were recorded. Serological markers included erythrocyte sedimentation rate (ESR), C-reactive protein (CRP), RF (IgM), and ACPA. Patients with chronic inflammatory diseases, chronic renal failure, and chronic liver disease were excluded from the study. Four millimeters of venous blood were dispensed gently and serum was separated and divided into two aliquots. One was stored at −20°C for assay of serum anti-CarP and ACPA while the other was used for immediate assay of alanine aminotransferase, aspartate aminotransferase, urea, creatinine, CRP, and RF. Quantification of anti-CarP levels in the sera of all studied subjects was done according to the manufacturer's instructions of the commercially obtainable human enzyme-linked immunosorbent assay kit (ELISA) for anti-CarP (Nanjing Pars Biochem CO., Ltd. China). The sensitivity by this assay was 0.1 U/ml. The cut-off for positivity for anti-CarP antibody (best sensitivity and specificity using receiver-operating characteristic (ROC) curve [Figure 1] in this study was 3.99 U/ml giving a sensitivity of 78.1% and specificity of 93.3%. Determination of ACPA by ELISA technique was done according to the manufacturer's instructions of the commercially available human ELISA kit for ACPA (ORGENTEC Diagnostika GmbH, Germany). Statistical analysis was carried out using SPSS version 21.0 (SPSS Inc., Chicago, IL, USA). Numerical data were expressed as mean value ± standard deviation while categorical data presented as numbers and percentage. Clinical and serological data variances between groups were estimated by t-test for normally distributed values. Spearman rank-order correlation was carried out between variables. Correlations between categorical data were compared using Chi-square analysis. ROC curves were used to assess the diagnostic utility of anti-CarP antibody as assessed by the area under the curve (AUC). Differences between groups were considered to be statistically significant when P < 0.05. The study was approved by the ethics committee of our institute. Informed written consent was obtained from all participants. Anti-CarP antibody serum levels in RA patients were significantly higher than in control. Out of 96 RA patients; 74 were positive for anti -CarP anti body including 47patients with early RA while only 5 subjects in control group were positive. Demographic, clinical, and laboratory data are shown in [Table 1]. ROC curve study for diagnostic efficacy of anti-CarP antibody in RA diagnosis in RA patients and controls had established a significant (P < 0.0001) AUC of 0.928 (95% confidence interval [CI], 0.890–0.967) [Figure 2]. 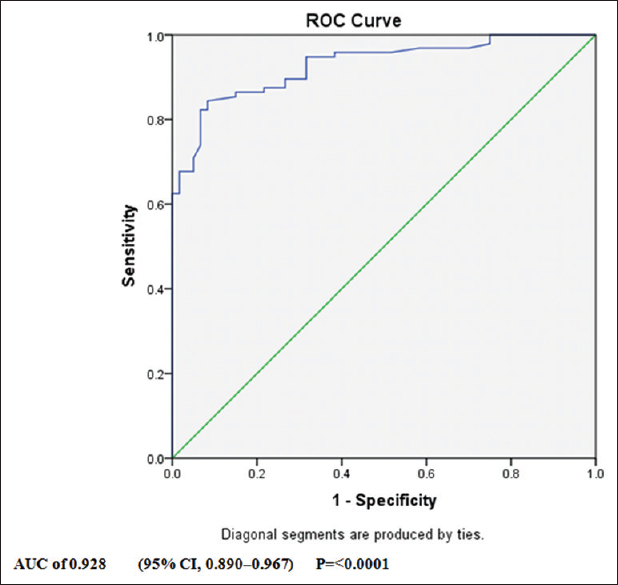 At a cutoff of ≥3.99 U/ml, the ROC curve yielded a sensitivity of 78.1%, a specificity of 93.3%, a positive predictive value (PPV) of 0.95, and a negative predictive value (NPV) of 0.72 [Figure 2], while in diagnosis of early RA patients, ROC cure study had verified a significant (P < 0.0001) AUC of 0.950 (95% CI, 0.912–0.987) [Figure 3] and at the cutoff level gave a sensitivity of 85.4%, a specificity of 93.3%, a PPV of 0.90, and an NPV of 0.86. In early RA (56 patients), RF was positive in 39 patients (69.4%), and by joining anti-CarP antibody with RF, the number of positive patients became 52 patients (92.8%), a 23.4% increase in seropositive patients. Hence, seropositive anti-CarP antibody gave a great value in diagnosing RA when added to seropositive RF cases. Moreover, ACPA was positive in 42 patients (75%), and by adding anti-CarP antibody to ACPA, the positive cases became 49 patients (87.5%). the positive cases became 49 patients (87.5%) [17.5% increase in seropositive patients] [Table 2]. In seronegative ACPA patients (14 patients), anti-CarP antibody was positive in five patients narrowing the serological gap by 8.9%. When including positive anti-CarP antibody in RA diagnosis, 89.2% (50 patients) of our patients became seropositive versus 82.1% (46 patients) with positive ACPA and RF antibodies. The pattern of serological markers in early RA diagnosis is shown in [Table 3]; anti-CarP antibody was more sensitive but less specific than ACPA with high NPV; however, it was more sensitive and more specific than RF with high PPV and NPV. Moreover, in patients with negative ACPA; anti-CarP antibody had low sensitivity, high specificity, high NPV, and low PPV, while in patients with negative RF, it had high sensitivity and high specificity values with high NPV and high PPV. Routinely available serological biomarkers are absent in one-third of RA patients and even more in early disease. In early RA, 61.6% showed to be positive for ACPA. Both sensitivity and specificity of the ACPA is significantly higher than the RF. Recognizing patients at risk at a very early stage is extremely desirable in view of the irreversible joint injury and long-lasting disability that can follow delayed diagnosis and treatment of RA. In our study, we evaluated anti-CarP antibody for early RA diagnosis and to what degree it could narrow the serological gap in RA diagnosis. We found that the serum levels of anti-CarP antibody were significantly higher in RA patients compared with the controls and the patients with anti -CarP antibody positive serology were 74 (77.1%) in RA patients (including 47 in early RA) while in healthy subjects were 5 subjects (8.3%). Similar results were also noted in a previous study in which anti-CarP antibody positivity was seen in 40%–50% and 44.9% for RA patients. Likewise, 44 (41.9%) RA patients were positive for anti-CarP antibodies and 11 (22%) in the control group. It has been noted that anti-CarP antibodies can exist in healthy subjects many years earlier the onset of manifested RA., In an another cohort, anti-CarP antibodies were shown to predict the development of RA, independent of anti-CCP antibodies. 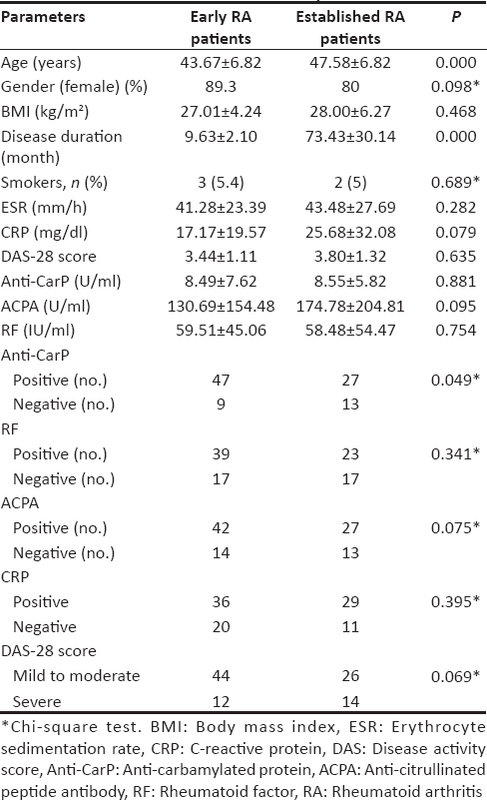 In early ACPA-seronegative RA 14 patients, anti-CarP antibody was positive in five patients narrowing the serological gap by 8.9% with low sensitivity and high specificity values [Table 3] in line with other study which reported higher positivity percent; 10.4% in ACPA-seronegative patients. For all patients, adding anti-CarP antibody for RA diagnosis increased the seropositivity from 82.1% to 89.2%. Other study evaluated anti-CarP antibody in combination with other biomarkers in early arthritis, and it increased the sensitivity by only 2.2% in differentiating RA from other types of arthritis. 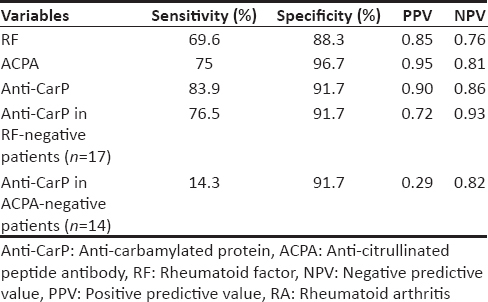 Regarding RA diagnosis, anti-CarP antibody had high sensitivity (76.5%), lower specificity, lower PPV, and higher NPV than ACPA [Table 3] in agreement with others who stated that sensitivity of anti-CarP antibodies for diagnosis of early and seronegative RA was 84%. These data could be of great clinical influence in RA diagnosis in seronegative RA. Smoking has a great risk for RA, disease activity, and linked to various autoantibodies production in RA specifically with ACPA. In the present study, the majority of the patients were nonsmokers (91 patients) while 74 patients were positive for anti-CarP antibody implying no correlation between smoking as a risk factor for RA and the anti-CarP antibody production which postulated a possible unique mechanism in RA pathogenesis rather than protein citrullination which is linked to smoking. In a previous study there was no evidence to support the hypothesis that smoking would induce anti-CarP antibodies. Hence, anti-CarP antibody may have a role in RA pathogenesis mainly through immunological interaction with carbamylated proteins in the joint. Limitations of our study were as follows:first, it was a cross-sectional study with relatively small number; second, it included patients already diagnosed and on specific treatment which may carry bias for seropositivity and negativity as a treatment effect. In our small cohort we found that Anti-CarP antibody is an useful biomarker in the diagnosis of RA especially in ACPA seronegative patients. A prospective large study on healthy subjects with positive anti-CarP antibody is required to evaluate the future prevalence of RA in these populations. Gravallese EM, Monach PA. Rheumatoid synovitis and pannus. In: Hochberg MC, Silman AJ, Smolen JS, Weinblatt ME, Weisman MH, editors. Rheumatology. 4th ed. London, UK: Elsevier Ltd.; 2008. p. 841-65.
van der Helm-van Mil AH, Huizinga TW. The 2010 ACR/EULAR criteria for rheumatoid arthritis: Do they affect the classification or diagnosis of rheumatoid arthritis? Ann Rheum Dis 2012;71:1596-8. Shi J, Knevel R, Suwannalai P, van der Linden MP, Janssen GM, van Veelen PA, et al. Autoantibodies recognizing carbamylated proteins are present in sera of patients with rheumatoid arthritis and predict joint damage. Proc Natl Acad Sci U S A 2011;108:17372-7. Humphreys JH, Verheul MK, Barton A, MacGregor AJ, Lunt M, Toes RE, et al. Anticarbamylated protein antibodies are associated with long-term disability and increased disease activity in patients with early inflammatory arthritis: Results from the Norfolk arthritis register. Ann Rheum Dis 2016;75:1139-44. Shi J, van Veelen PA, Mahler M, Janssen GM, Drijfhout JW, Huizinga TW, et al. Carbamylation and antibodies against carbamylated proteins in autoimmunity and other pathologies. Autoimmun Rev 2014;13:225-30. Jiang X, Trouw LA, van Wesemael TJ, Shi J, Bengtsson C, Källberg H, et al. Anti-carP antibodies in two large cohorts of patients with rheumatoid arthritis and their relationship to genetic risk factors, cigarette smoking and other autoantibodies. Ann Rheum Dis 2014;73:1761-8. Brink M, Verheul MK, Rönnelid J, Berglin E, Holmdahl R, Toes RE, et al. Anti-carbamylated protein antibodies in the pre-symptomatic phase of rheumatoid arthritis, their relationship with multiple anti-citrulline peptide antibodies and association with radiological damage. Arthritis Res Ther 2015;17:25. Shi J, van de Stadt LA, Levarht EW, Huizinga TW, Hamann D, van Schaardenburg D, et al. Anti-carbamylated protein (anti-CarP) antibodies precede the onset of rheumatoid arthritis. Ann Rheum Dis 2014;73:780-3. Gan RW, Trouw LA, Shi J, Toes RE, Huizinga TW, Demoruelle MK, et al. Anti-carbamylated protein antibodies are present prior to rheumatoid arthritis and are associated with its future diagnosis. J Rheumatol 2015;42:572-9. Mydel P, Wang Z, Brisslert M, Hellvard A, Dahlberg LE, Hazen SL, et al. Carbamylation-dependent activation of T cells: A novel mechanism in the pathogenesis of autoimmune arthritis. J Immunol 2010;184:6882-90. Vidal-Bralo L, Perez-Pampin E, Regueiro C, Montes A, Varela R, Boveda MD, et al. Anti-carbamylated protein autoantibodies associated with mortality in Spanish rheumatoid arthritis patients. PLoS One 2017;12:e0180144. Raza K, Falciani F, Curnow SJ, Ross EJ, Lee CY, Akbar AN, et al. Early rheumatoid arthritis is characterized by a distinct and transient synovial fluid cytokine profile of T cell and stromal cell origin. Arthritis Res Ther 2005;7:R784-95. van Venrooij WJ, Zendman AJ, Pruijn GJ. Autoantibodies to citrullinated antigens in (early) rheumatoid arthritis. Autoimmun Rev 2006;6:37-41. Wiik AS, van Venrooij WJ, Pruijn GJ. All you wanted to know about anti-CCP but were afraid to ask. Autoimmun Rev 2010;10:90-3. Scott DL, Wolfe F, Huizinga TW. Rheumatoid arthritis. Lancet 2010;376:1094-108. Scinocca M, Bell DA, Racapé M, Joseph R, Shaw G, McCormick JK, et al. Antihomocitrullinated fibrinogen antibodies are specific to rheumatoid arthritis and frequently bind citrullinated proteins/peptides. J Rheumatol 2014;41:270-9. Verheul MK, van Erp SJ, van der Woude D, Levarht EW, Mallat MJ, Verspaget HW, et al. Anti-carbamylated protein antibodies: A specific hallmark for rheumatoid arthritis. Comparison to conditions known for enhanced carbamylation; renal failure, smoking and chronic inflammation. Ann Rheum Dis 2016;75:1575-6. Othman MA, Ghazali WS, Hamid WZ, Wong KK, Yahya NK. 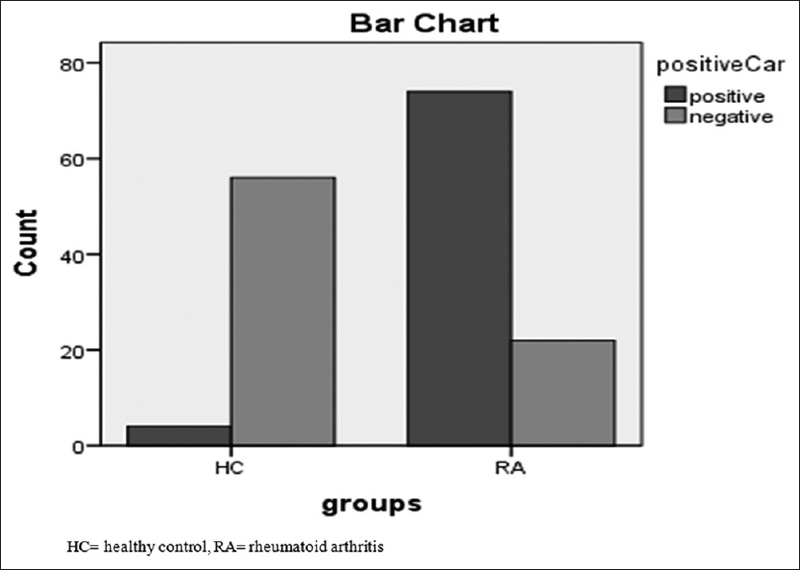 Anti-carbamylated protein antibodies in rheumatoid arthritis patients and their association with rheumatoid factor. Saudi Med J 2017;38:934-41. Shi J, van de Stadt LA, Levarht EW, Huizinga TW, Toes RE, Trouw LA, et al. Anti-carbamylated protein antibodies are present in arthralgia patients and predict the development of rheumatoid arthritis. Arthritis Rheum 2013;65:911-5. Regueiro C, Nuño L, Ortiz AM, Peiteado D, Villalba A, Pascual-Salcedo D, et al. Value of measuring anti-carbamylated protein antibodies for classification on early arthritis patients. Sci Rep 2017;7:12023. Trouw LA, Mahler M. Closing the serological gap: Promising novel biomarkers for the early diagnosis of rheumatoid arthritis. Autoimmun Rev 2012;12:318-22.
van Wesemael TJ, Ajeganova S, Humphreys J, Terao C, Muhammad A, Symmons DP, et al. Smoking is associated with the concurrent presence of multiple autoantibodies in rheumatoid arthritis rather than with anti-citrullinated protein antibodies per se: A multicenter cohort study. Arthritis Res Ther 2016;18:285. Too CL, Yahya A, Murad S, Dhaliwal JS, Larsson PT, Muhamad NA, et al. Smoking interacts with HLA-DRB1 shared epitope in the development of anti-citrullinated protein antibody-positive rheumatoid arthritis: Results from the Malaysian epidemiological investigation of rheumatoid arthritis (MyEIRA). Arthritis Res Ther 2012;14:R89.